In addition to the injuries below, many of the riders who raced in San Diego have used social media to report burns and bike damage. Riders are saying the symptoms are the result of drying agents mixed in with the dirt. The issue has prevented multiple riders from being able to perform their weekly riding and training routines. Comment: Jason Anderson had surgery after a practice crash left him with a broken arm, ribs, lacerated liver, partially collapsed lung, and back injuries. Over the weekend he told us it’s unlikely he’ll be back for any supercross in 2019. Comment: Bloss tore his ACL before the season and will miss all of Monster Energy AMA Supercross. 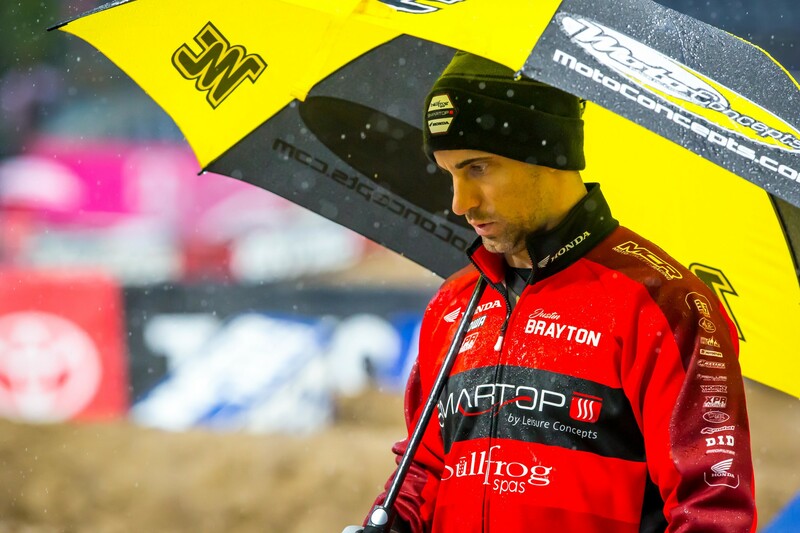 Comment: Brayton suffered a partially torn ligament in his thumb in San Diego. He is expected to line up for Minneapolis. Comment: Hill crashed during practice in San Diego and took a handlebar to his rib cage. After visiting the Alpinestars Mobile Medical unit, Hill was taken to the hospital due to concerns of a possible ruptured spleen. Fortunately his spleen checked out okay, although he did sustain some cartilage damage in his rib cage. We’re bummed to report that @justinhill46 will not be racing this weekend in Minneapolis, due to injury. In Justin’s words: “I’ve spent the week so far in a lot of pain and have very limited movement, due to injuring my ribs at San Diego. It’s hard to picture racing when everyday things are this painful. Fortunately for me, I have every rehabilitation resource I could have at my fingertips! I’m itching to get back on the bike and get the results I know that I’m capable of." Comment: Osborne missed the first five races after bending some hardware on his collarbone before the start of the season. He was hoping to be back for Minneapolis but another crash has delayed his 450SX debut. He hopes to be back for Arlington. Comment: Peick had a bad crash during the off season at the Paris Supercross. He underwent multiple surgeries and is now on the mend. To help him out via Road 2 Recovery go here. Comment: Raper broke his pelvis, a pair of vertebrae, and his nose in late November. There is no timetable on his return. Help your fellow moto enthusiast out via Road 2 Recovery. Comment: Tedder has been out all season due to lingering wrist issues. He underwent multiple surgeries to handle the problem and hopes to be back riding in February, and racing in March. Comment: Stewart had surgery after crashing hard in Glendale. The team says he’s looking at a three month recovery time. Comment: Ames suffered a compound fracture to his left radius and ulna before the season. He also dealt with compartment syndrome and is still fighting an infection in his arm. He’s not expected to race this season. Comment: Due to a Bennet fracture in his thumb, Craig wasn’t sure if was going to ready to race this weekend or not. But on Wednesday the decision was made for him to line up in Minneapolis. Comment: Lawrence injured his collarbone roughly eight weeks ago. He was on schedule to be ready for Minneapolis until crashing and reaggravating the injury two weeks ago. At this time there is no timetable for his recovery, although a return to racing before the end of the season has not been ruled out. Comment: Martin is out for the year due to a burst fracture to his vertebrae sustained last year at Muddy Creek. Comment: Merriam has been dealing with a back injury that wasn’t healing. There is not an exact timetable for his return. Comment: Sexton will return to racing in Minneapolis after injuring his collarbone before the season.